NRCS has worked with agricultural producers to restore and protect more than 250,000 acres of bottomland hardwoods in Louisiana in priority areas. Fresh into my career as a wildlife biologist with USDA’s Natural Resources Conservation Service (NRCS), two things happened: a new Farm Bill conservation program was born, and the Louisiana black bear was listed under the Endangered Species Act. Both were very connected, even if I didn’t know it at the time. The new program was the Wetlands Reserve Program (WRP), created in the 1990 Farm Bill and piloted in 1992 in nine states, including Louisiana. This program provides technical and financial assistance to farmers who want to voluntarily restore and protect wetlands with long-term conservation easements, enabling them to restore difficult-to-farm cropland back into wetlands. Soybean prices had reached historic highs in the 1960s and 1970s, and hundreds of thousands of acres of bottomland hardwood forests in the lower Mississippi River alluvial valley were cleared for soybean production. It didn’t take long for prices to drop, the land to lose its rich organic matter, and rainfall and backwater to cause frequent floods, making it difficult to farm in some places. The loss of bottomland hardwood forests greatly wounded Louisiana black bear populations, which dipped to about 200 when the U.S. Fish and Wildlife Service (FWS) determined protections were needed under the Endangered Species Act, for the iconic “Teddy Bear”. We soon realized how important a tool WRP could be in restoring bottomland hardwoods and other wetland habitat for the Louisiana black bear, which is one of 16 subspecies of the American black bear, unique to Louisiana, western Mississippi and eastern Texas. As with any listing, many landowners were scared of the unknown, especially the potential ramifications on use of private property. When these two events collided, it ended up being the complete opposite of what most thought would happen. NRCS used its connection to local farmers and network of local soil and water conservation districts to show practical means for farming on suitable lands and creating habitat on those less suitable. Many farmers in Louisiana saw WRP as both good for their agricultural operations and for wildlife. Producers received a payment for easements, which helped offset potential losses. I enjoyed working one-on-one with producers, helping them restore habitat while at the same time improving their private lands. 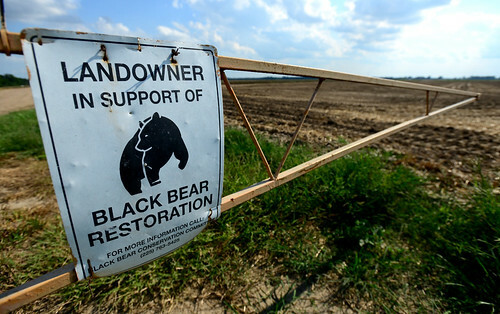 During the past 24 years, NRCS producers have restored and protected more than 250,000 acres of bottomland hardwoods in key areas for the Louisiana black bear. The state now leads the nation in conservation easement enrollments. 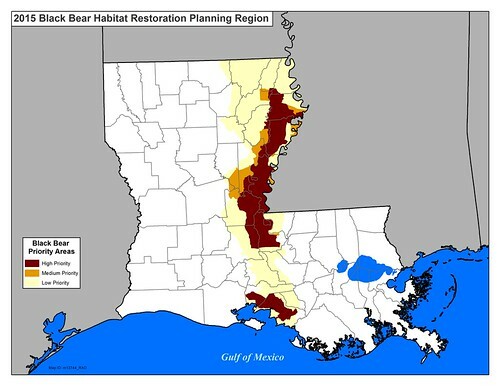 For the Louisiana black bear and countless other species, bottomland hardwood forests were restored at an unprecedented scale and the enlarging and connection of habitat corridors led to the bear’s recovery. Today, Fish and Wildlife announced the removal of the Louisiana black bear from the Federal Lists of Endangered and Threatened Wildlife, something I never thought I would see during my career. And as one FWS leader put it, farmers using USDA programs like WRP restored the “lion’s share” of habitat in the region. Even as the growing global population increases the demand to produce more food, fiber and fuels on working lands, private lands conservation offers us tools to integrate wildlife-friendly practices on working lands. The Louisiana black bear is one example of how agriculture and wildlife can thrive together. The delisting of this species adds to the success that we’re seeing across the country built on species conservation and stewardship by private landowners. Just in the past year, we’ve seen the rebound of both the Bi-State and greater sage-grouse, New England cottontail and Oregon chub. This success story here in Louisiana shows the vital role that private lands play in providing habitat for wildlife. It’s been a rewarding career with NRCS. I have two grandchildren (so far), and I am anxious to tell my version of the story of the Teddy Bear. NRCS focused conservation efforts in priority areas for conservation (PACs) in the Delta region of Louisiana. Yes Yes Yes. Very important. Wildlife habitat is as important as farms. Working together, having a farmer respecting and helping wildlife habitat, what a group of people!